A leak-tight joint between tube and tubesheet is critical to the proper operation of steam surface condensers and other heat exchange equipment. Loss of tube-to-tubesheet joint integrity can be generally traced to three root causes: corrosion and/or erosion of the tubesheet material, improper rolling of the tubes during installation, and mechanical stresses during operation. Tubesheet corrosion is generally caused by dissimilarities with higher alloy, more noble tube material. This situation is becoming more and more prevalent as stainless steel and titanium tubes are being retrofitted into older condensers and heat exchangers. Loss of tubesheet metal due to corrosion leads to the compromise of tube-to-tubesheet joint integrity. The alternatives for tubesheet protection are generally cathodic protection or the use of coatings. Cathodic protection of tubesheets is difficult due to variations in water quality, turbulence, and the inability to space anodes and reference cells effectively. Also, since cathodic protection systems do not have high visibility, they receive little attention from operation and maintenance personnel. Thin film coating systems of 25 to 80 mils have failed due to improper application, and because a thin film thickness is insufficient to withstand the long-term abuse of cooling water systems. The Plastocor Process for tubesheets entails the precise molded application of an ultra durable protective Cladding. The tubesheet and tubes are completely encapsulated and locked in by a thick, 100% solids epoxy shield of 200 +/- 40 mils. This polymeric shield is in addition to the thickness of material required to rebuild lost tubesheet metal. This patented process fashions a radially flared, high gloss, inlet and outlet tube opening, serving to dramatically reduce flow resistance and fouling. For on-line tube cleaning systems, a reduction of sponge ball wear is also realized. The substantial nature of the System adds strength and integrity to the tube-to-tubesheet joint. Tube push-out strength enhancement of 2000 lbs has been documented simply due to the application of the System. The Plastocor Cladding withstands physical abuse, impact, and other physical/chemical stresses associated with the operation of a cooling water system. The System is designed to endure these rigors over the very long-term. Case histories date flawless performance back to 1963. 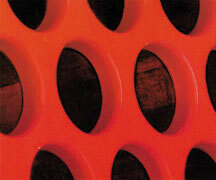 The Plastocor System is engineered as the permanent solution to tubesheet corrosion problems. Plastocor Inc., 100 Research Road, Hingham, MA 02043. Tel: 781-749-5050; Fax: 781-749-5075.